Now, as most of us know, people use twitter in a number of different ways. Some people use it to share their content, whilst some others use it for networking purposes, or telling people what's on their mind. 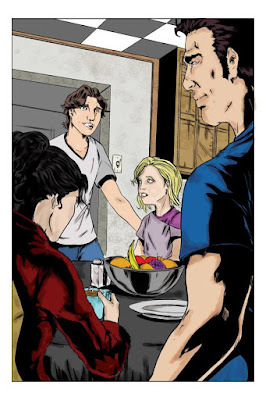 Yet did you know, that you can also use twitter to create a webcomic? Here, check out what my mate Martin has to say about it and why. 1) What are your own origins, Martin? I was born in Winchester, Kentucky, and then moved to Florida when I was about 5 years old. I grew up in a small church town called "Dade City", and to me, it was the epitome of the "Blink and You'll miss it" type town. My history in comics dates back to early 2000's when I interned at Crossgen Comics. I was only there for a few months, but it was an awesome experience. I then took about 10 years away and eventually found my way back again, and since then I've been working on everything from my own works such as "Joshua Black", "Project: APEX", and "Old World 50", to being honored to be able to work with IDW Publishing, Hashtag Comics, and Devil's Due Publishing / 1First Comics. 2) What inspired you to create, ‘I Fight Ghosts’? #IFightGhosts is the easiest one of all my creations to explain. It's origin, or inspiration for it is just so silly. Shawn Langley and myself were going back and forth on twitter one evening, and each tweet we sent was more ridiculous than the last. At some point we started tagging each post with #IFightGhosts. It then grew into silly concepts and ideas... "A Specter fighting Casper for money." This led to a ton of dumb ideas, and we started trading art back and forth for it. Those original jokes became what we call "season 01". 3) In your own words how would you describe this story? It's dumb, silly, nonsensical fun. It's not a thinking man's comic. It's just us being ridiculous. It has heart, but it isn't grounded in any type of ideology and it's not afraid to make fun of itself. We always throw out funny elevator pitches. "Ghosts? Cthulhu? Gormandizers? Furries? Dickens? We got it all!" The actual synopsis reads more like this though. The story chronicles the exploits of Darren Palmer, a twenty-something con man who was killed in a freak accident, and given a second chance at redemption by serving as a "Spectromancer". His task was to hunt down rogue spirits who've escaped the Afterlife's judgement. However, Darren is all about personal gain, and instead begins to find ways to exploit his new powers for profit. 4) What song would you say best represents this comic and why? I am an audiophile, so this question is unfair. Yet I think today I shall say "People who Died" by The Jim Carroll Band. 5) If you could get a celebrity – either living or dead – to promote your wares, who would you choose, and why would you want to choose this particular person? This one is a unique question. I feel like I'd love to have some of the people who influence the tone. 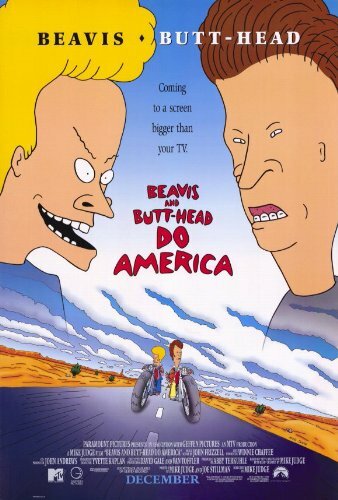 Mike Judge would be awesome, as he pioneered a lot of what we're trying to do now. In a lot of ways Beavis and Butthead paved the way for Archer, Bob's Burgers, Rick and Morty. 6) What have you learnt about yourself through this endeavor? If you mean through #IFightGhosts, I'd say I've learned how important it is to keep a schedule. Doing a series that is updated on a weekly basis is very difficult without proper funding. We are talking about setting up a paypal donation button on the site to compensate for this, plus it would be a welcome way to provide content consistently for readers. I think it has helped me learn to loosen up and I definitely learned I'm not as funny when I have to think about it, as I am when it's improvised. Writing a weekly joke is exhausting. 7) During your time in this field, what is the one thing that has kept you in good stead? I am really big on helping others. I always take the time to assist new creators and aspiring artists and writers. I think this builds up some professional karma. I've managed to show people I am a hard worker, and I push myself and others to do the absolute best they can. I guess my energy, passion, and unbridled and aggressive approach to making comics keeps me in good stead. 8) If ‘I Fight Ghosts’ had a motto, what would it be? I guess it depends. If it is from the story and more specifically the Spectromancer's perspective, then it is undoubtedly "Give me your money!". 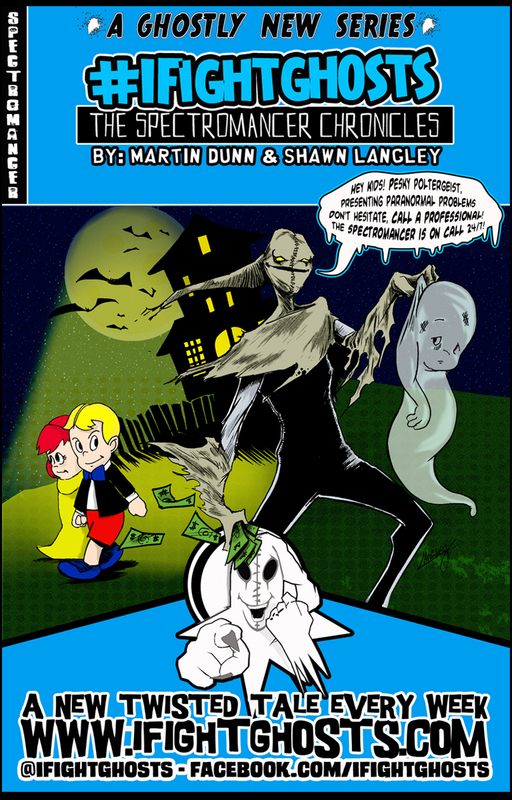 And on that note, I'd like to thank Martin for telling us about his webcomic, #IFightGhosts, before directing you towards his website, facebook, and twitter pages.